This massive Gothic revival structure would have dramatically changed the skyline of Westminster but, perhaps thankfully, never got further than the drawing board. 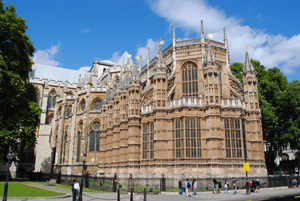 The proposal was mooted in the early 1900s apparently amid concerns that, thanks to the number of monuments and memorials being placed within its walls, Westminster Abbey was becoming overcrowded. It was also apparently proposed as a memorial to Prince Albert. The designs were the work of John Pollard Seddon – architect for the Church of England’s City of London Diocese – and another architect Edward Beckitt Lamb. They consisted of a 167 metre (548 foot) high tower and adjoining vast reception hall and numerous other galleries which sat at a right angle to the eastern end of the abbey minster (pictured). Given the Clock Tower containing Big Ben is only 97.5 metres (320 feet high), the structure would have completely dominated its surrounds. The project was exhibited at the Royal Academy in 1904 but, requiring an enormous and impractical budge (not to mention its dominating aesthetics), was never pursued any further.